Buffalo buffalo, buffalo Buffalo buffalo. That's a complete, grammatically correct sentence. No really. It's a command telling a bison from Buffalo, NY to baffle or intimidate another bison from Buffalo, NY. And this wikipedia page says you can actually use eight "buffalo's" in a row and make a grammatically correct sentence. Just try to wrap your brain around that. Yeah. And people say that English is a practical language. When I was a kid, I had all kinds of allergies, including allergies to foods. My mom did too. So an allergy specialist recommended that we rotate our foods so that we wouldn't develop allergies to them. I could only eat beef one out of every four days. So on those other days, we'd eat chicken one day, we'd eat fish another day, and on the remaining day...well, we'd get adventurous. My dad had an international company ship us exotic meats from around the world. They were packaged with dry ice, and man was that stuff fun to play with! The dry ice, I mean, not the meats. But anyway, the point is that I tried buffalo, among many other bizarre meats, at a very young age, and it's always been my favorite red meat, which puts it very high in the running for my favorite food, which puts it very high in the running for my favorite thing on planet Earth. So, this ain't my first day at the buffalo rodeo. In fact, I've even had a Bison Burger at a Red Robin restaurant in my hometown in central PA circa 2008/2009. Apparently Franklin County, PA is more open to buffalo burgers than either southern California or south Jersey, because my wife and I asked about buffalo burgers at Red Robins in both of those places, and in each instance, we got blank stares followed by talk about beef burgers containing buffalo sauce, bleu cheese, and ranch dressing. But freakin' A, that bison burger at the Red Robin in my hometown was the best restaurant burger I ever had. I think I paid $2 more than their average dead cow sandwich. Worth it, if you ask me. I guess the powers that be must have heard a rumor about a weird family in historic Chambersburg, PA that ate buffalo meat and told their friends that it was tasty, and so they decided to make that their test market. Or maybe they slaughtered the aged, dying bison from ZooAmerica in Hershey for cheap, and then had them shipped down I-81. Either way, it totally worked. 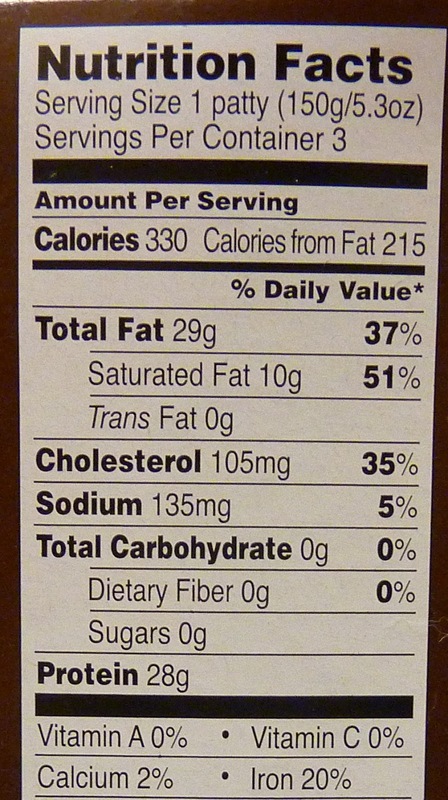 Despite the TJ's product's high fat content (20%), fortunately it didn't taste or feel that way. I like to think that most of that fat cooked out of it when we put it in the skillet. 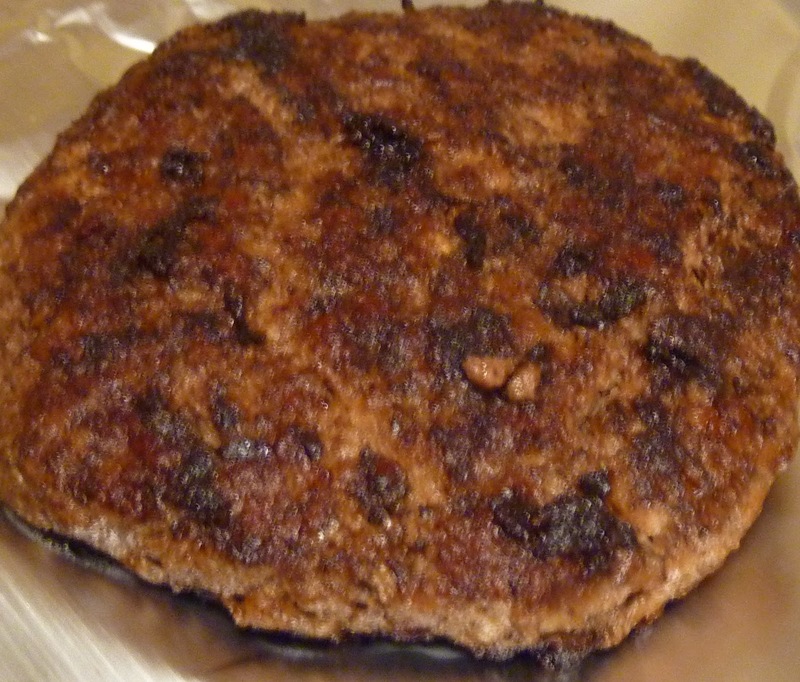 The pan was full of liquid grease after we cooked the burgers in a thin glaze of Coconut Oil Spray. 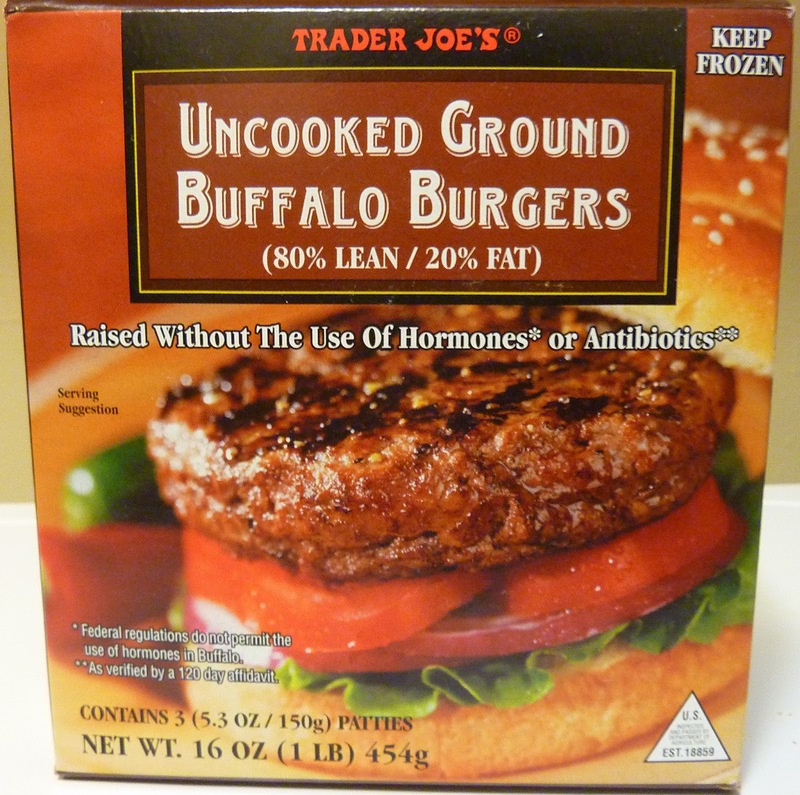 The taste of buffalo meat is very similar to beef, but it's even more flavorful in my humble opinion. During the buffalo's attack, it tasted like it was going to be gamey, but then it evolved into a non-gamey, tannin-free alkaline red meat flavor, and finished clean, with a medium-bodied "butter beef" essence. Of all the stupid things I've written on this blog, using wine critic terminology to describe buffalo burgers is bound to attract the most internet trolls, although I must point out that Sonia coined the term "butter beef," not me. In other news, these patties are 'spensive. $10 for three. Yep. They're tasty, but if you're preparing for the imminent decline of the US dollar like I am, you better budget your bucks before you buy bloody buffalo burgers. Boom. Oh, and that reminds me: these patties were unbelievably bloody. Like readily dripping with red blood out of the package. Delightfully macabre. I give this product 4.5 stars for its exceptional taste. Sonia gives it a 4. Click here for a pic of the raw product. I'm wonder were are from this buffalo ?